Registration opens on Saturday for what is surely the Capital's most dapper bike ride. Now in its third year the Tweed Run has grown from a lark for a group of friends, to a 10 mile ride where 450 suitably attired riders wind their way through the Capital. That attire is important too. The organisers stipulate tweed suits, jaunty flat caps and that pair of plus fours that you have secretly always wanted. Basically, imagine accidently stumbling into a Jeeves and Wooster novel or the fellows of the Chap magazine suddenly developing a velocipede obsession. If you want to join the ride this year, you will have to be quick as registration opens on Saturday at noon. Last year all the spots were filled within 45 minutes. The cost is £5 which goes to the Bikes4Africa. There are prizes during the day including the best dressed and most smashing moustache, before a finish with evening cocktails. 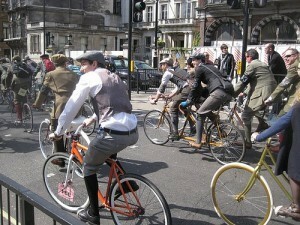 The Tweed Run takes place on 9 April at 11am.